First and foremost it’s being comfortable in your own skin, then any piece of clothing you put on is just icing on the cake. My favorite thing to wear is PINK! I feel like I buy too much pink, but I can’t help it. I just feel so feminine in pink! I love to mix different tones of pink or sometimes just add small touches. Don’t be afraid to wear tons of color, or to incorporate colorful pieces in your daily dress. Shania twain sings “ men, shoes, short skirt, woah woah oh …. I love being a woman” – being a woman means taking advantage of our femininity. Being a woman is too much fun, why not flaunt who we are? Manifest our personality in what we wear? We wear clothes every day – why not make it special? I LOVE this look! 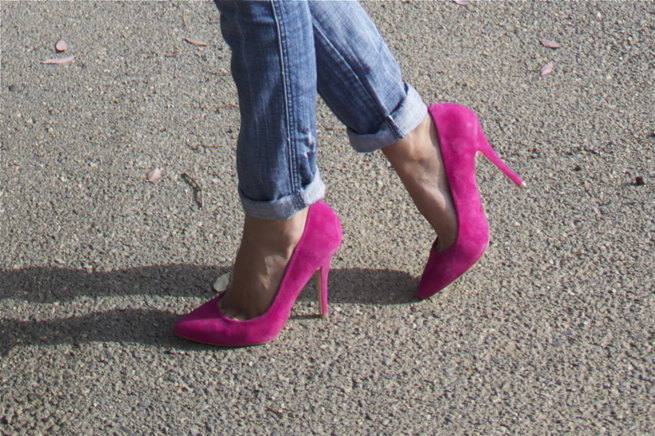 The light pink with the hot pink heels is so fun :) Thanks for the comment, I would love to stay connected on GFC and Bloglovin, following you now on both (bloglovin #28), please follow back! I love your blog I am now your newest follower..Hope you follow back! Lovely pink tones! you're like my BFF, she loves pink so much. Love your blog!You are ABSOLUTELY GORGEOUS!!! I'm following you now on GFC and Bloglovin, really hope you will do the same! you are so beautiful! love the neutral top with those bright, hot shoes!!! definitely following... would love you to check out my blog - i love to hear any and all feedback! thanks for stopping by my blog. I'm following you on blog lovin'. Hey dear, thanks for your sweet comment! This is so cute! I love the litle bows on your top and those shoes are such a pretty shade of pink! I have some flats in the same color. Yes! Let's definitely follow each other! Following you on both bloglovin and GFC now!! a bow & polka dot shirt? shut.up. it's fabulous!!! and so are those neon pink heels!!! This is such a cute post - I am in love with the shirt...especially after I saw the closeup detail shot of the pattern! Great outfit! Especially love the shoes! Just followed you on bloglovin! LOVE the pop of pink! And you have amazingly gorgeous hair. Would love to see a hair tutorial. Love your shoes color ^^ it added color to the whole outfits. Hi Amy !!!! Thanks for comming to my blog !!! I'm glad you apreciate it !!! 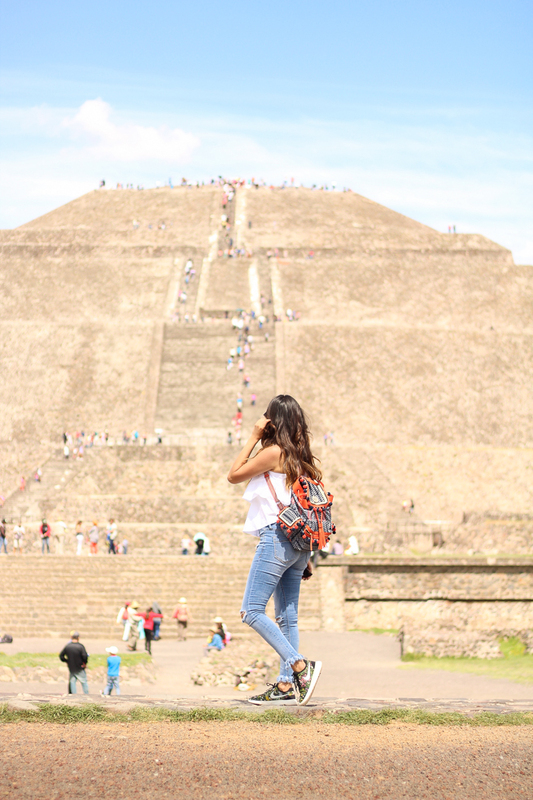 I love your blog and your style ! I'm now a new follower at you! Ooooh, looove your cute outfit! Specially the blouse! Of course, follow u right now, hope u can follow me back! Thank you for your comment! Of course we can follow each other. I'm following and waiting for you. i follow you now with GFC and bloglovin! Love your blog! It's filled with great fashion. You have a great sense of style. Thanks so much for stopping by my blog and commenting. I'd love for us to connect with each other on Bloglovin and google! I'm already following you on both of them, so I'd really love it if you could follow me back as well? =D I'm loving this outfit so much! You look like a total supermodel! I'm also a huge fan of pink too! love your blouse and pink heels! Love these shoes! The colour is amazing. Anyhow, sure, let´s stay connected. Following you now on GFC. Hope you can do the same for me? Thanks!! I love that top! Yes, let's follow each other! I'll go first. What a cute blouse, and those shoes are fabulous! Cute!! Love the detailing on the blouse, and the heels are fantastic! Love the heels and the blouse! love your sense of style. Thanks for reaching out to me, followed you via GFC and Bloglovin. LOVE YOUR OUTFIT!!! Thank you for your comment! I would love to stay in touch.. I only have bloglovin.. So follow me there and I'll follow you back..
Hi Amy, I like your outfit - The Steve Madden shoes are great- I'm follow your blog via GFC and Bloglovin. Stephen O'Hare, President of Pedors Shoes gives the once-over on Diabetes, footcare, footwear, socks and embeds.